The Marlins gave Edinson Volquez two years and $22 million. Now, I know what you might be thinking: The Marlins might have to issue bigger guarantees in order to convince players to join them. But I don’t know that for sure. What I do know for sure is that Volquez turns 34 next summer. Last season he had a worse-than-average ERA, a worse-than-average FIP, and a worse-than-average xFIP. Those same three things apply, also, to his overall career numbers. Volquez isn’t much. Fifth starter, perhaps. The Pirates have given Ivan Nova three years and $26 million. Now, I know what you might be thinking: I should add in the modest performance-based incentives. But I just want to deal with the guarantee. Nova turns 30 in a matter of weeks. Last season he had an average ERA, an average FIP, and a better-than-average xFIP. This was supposed to be a terrible offseason to look for free-agent starters, but the Pirates still seem to have gotten something of a deal. Nova’s representatives told the Pirates they were looking for a deal in the range of five years and $70 million, according to a source. Nova’s agents wanted to pitch him as another Mike Leake. Leake got his five-year guarantee just last winter, and there are some similarities in the profiles, but Leake came with more durability in his background. He felt like more of a sure thing, whereas Nova has somewhat recently gone under the knife. It’s not that Nova can’t be Leake. Teams just would’ve been skeptical. So Nova wound up re-signing with the Pirates for less than the Blue Jays gave to J.A. Happ. Nova didn’t in any way become less hittable. Even with Pittsburgh, it’s not like Nova learned how to get soft contact. His improvement was simple: The Pirates just convinced him to throw a bunch of strikes. They convinced him to throw a bunch of first-pitch strikes, and they convinced him to throw a bunch of after-that strikes. Nova would get ahead and stay ahead, and so he walked almost literally no one. That’s one of those helpful things to eliminate, and strikeouts would happen almost as an accident. This plot shows starting-pitcher months. There were 657 starter months with at least 25 innings pitched. Nova was never particularly wild, but those two months with Pittsburgh were extreme. By walk rate — out of those 657 — Nova’s two months ranked fourth-best and sixth-best. Mike Leake’s July, by coincidence, is up there. So is his June. Nova just went after the zone over and over, so after the trade deadline, among all the starters with at least 50 innings, Nova ranked first in walk rate, fourth in FIP, and fifth in xFIP. Visually, the differences are actually subtle. On the left, you see where Nova pitched as a Yankee. On the right, you see where he pitched as a Pirate. 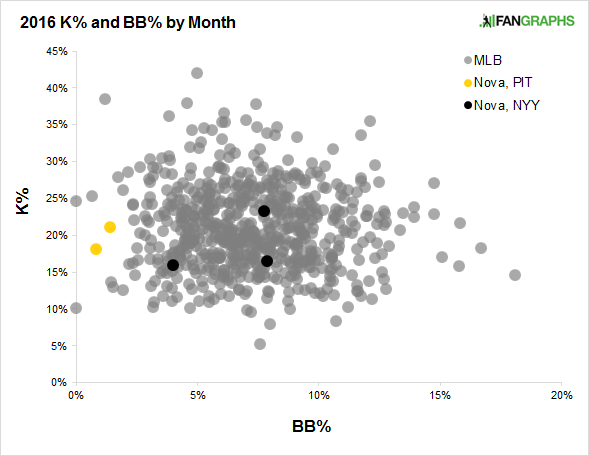 Nova brought his pitches up a little bit, and he’d also work hitters inside a little more often. He stopped chasing the edges, which meant he could find the zone and still sometimes get the edges even when missing. From the Pirates’ perspective, it wasn’t as easy as saying, okay, go throw strikes now. They had to demonstrate to Nova that he had less reason to be afraid. One of the things that allowed him to pitch with more confidence was that the ballparks gave him a greater margin of error. In Nova’s 2016 time with the Yankees, his “average” ballpark played like the Rogers Centre. In his 2016 time with the Pirates, his “average” ballpark played like Tropicana Field. Here are our park factors. Earlier on, Nova pitched in parks with a basic factor of 102, and a home-run factor of 106. After the trade, he pitched in parks with a basic factor of 97, and a home-run factor of 96. It all works together. It wasn’t just the Pirates identifying an undervalued player — they identified a player who could use a change of scenery. By removing Nova from New York, they could offer him a fresh start. He pitched confidently again, and he did so for two months, and just as importantly, he did so while throwing the same stuff he had before his elbow surgery. Nova used to pitch around 93 while favoring his curveball. He still pitches around 93 while favoring his curveball. When you think about Nova, you think about Happ. Go back a little longer, though, and you can see a link to Phil Hughes. Hughes was okay with the Yankees, but he’d give up home runs. He joined the Twins in 2014, and he immediately posted a 5.9 WAR. He went right after the zone and hardly walked anybody. The downside is that Hughes hasn’t been close to as successful since. But he was an earlier Yankee Stadium survivor. The Pirates might benefit from a similar concept. You see some Hughes. You see some Happ. You can also see some Bartolo Colon, or some prime Doug Fister. 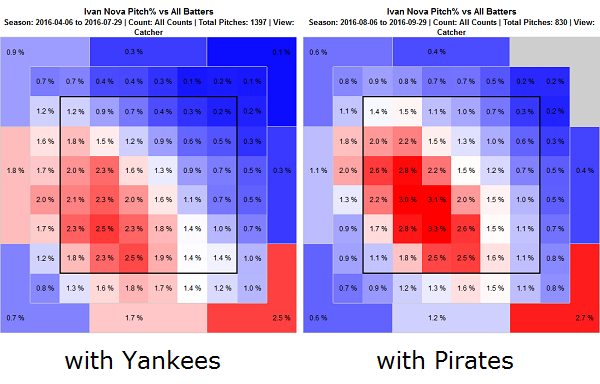 Ivan Nova is not the ace of the Pirates. He knows that and they know that. They know that nothing about Nova is a lock, and they know they got some help from an unimpressed assortment of other suitors. What this isn’t is the bargain of the century, but what is $26 million over three years? That’s what you pay when you’re expecting something like 3 WAR. Nova could exceed that in 2017 alone. All he has to do is pitch like he pitched. The park is the same, the coach is the same, and the catcher is the same. So it does feel to me like Ivan Nova slipped through the cracks. This was supposed to be a lousy offseason to want to pay for free-agent starters. Even given that, the Pirates re-signed Nova for less than he’s presumably worth. For Nova, it’s a continued opportunity to pitch in the right environment. For the Pirates, it’s crucial rotation help at a below-market cost. The free-agent market isn’t always for suckers. We hoped you liked reading Ivan Nova Slipped Through the Cracks by Jeff Sullivan! It’s crazy how shifting his pitches one “block” further into the strike zone dramatically improved his performance. The thing is, though, that Nova’s had crazy hot streaks like that before. He usually follows them with 150-200 innings of a 5 ERA. That, far more than the injury history, is why no one wanted to give him big money. I get totally understand that, but at the same time the Pirates are paying him like a 5/6 starter. Obviously his HR rate is going to go up, but playing 1/2 of you games in PNC Park instead of Yankee Stadium is going to help with that some. The walk rate is also pretty unsustainable too so this isn’t without risk, but I just don’t see much downside at this price point. No doubt. I think this is about what he deserved. For what it’s worth, he’d never come close to such a low walk rate before. And when he had two comparable stretches in terms of xFIP- — 2011 and 2013 — he was a better-than-average starting pitcher. He didn’t deserve to break anyone’s bank, but I think he deserved better than this. From 5/25/2013 to 8/9/2013, Nova had a 1.99 ERA/2.72 FIP/3.05 xFIP over 63.1 innings, in the AL East. From 8/14/2013 to 7/31/2016, his line was 4.88/4.97/4.34.